The primary human activity impacting soils is agriculture, and the soil nutrient most severely depleted in quantity by agriculture has been carbon. Conversion from natural to agricultural ecosystems has depleted the soil organic carbon (SOC) pool by as much as 60% in temperate regions, and 75% or more in tropical ones. Such conversion has resulted in losses of 8 to 32 tons of carbon per acre from some soils, mostly oxidized and emitted into the atmosphere as carbon dioxide. But depleting sinks of soil carbon is harmful in two ways. Adding carbon dioxide — the primary greenhouse gas — to the atmosphere increases retained solar heat in the planetary system and results in disruptive weather extremes such as we have been experiencing. Since 1975 the global level of greenhouse gases has been rising and average temperature has been increasing at a rate of 0.3˚F to 0.4˚F per decade. Organic carbon is a primary component of soil fertility, contributing to tilth, resilience, and crop production. Losing soil carbon decreases crop yields in at least three important ways: 1) it diminishes available water capacity, 2) it slows the supply of nutrients available to crops, and 3) it degrades soil structure and physical soil properties. Soil moisture content increases by 1 to 10 grams for every 1 gram increase in soil organic matter, which is 58% carbon. This increase can contribute to sustaining crop growth for 5 to 10 days between periods of rainfall – often a crucial period in areas of moderate precipitation. Preservation and enhancement of SOC also enhances cation exchange capacity and improves biotic activity of micro-organisms, facilitating the supply of nutrients available to crops. SOC is the primary source of energy and nutrients for the soil biota, who are system engineers and whose importance to ecosystem restoration cannot be overemphasized. Increases in SOC have also been found to enhance soil structure, making it less prone to crusting and compaction and aggregation — formation of the small raisin-sized clumps of soil in which many crucial biochemical functions can take place because they enable protection from excess oxygen or contain needed moisture. Productivity gains with increasing SOC are large, especially when combined with inputs of other nutrients and irrigation, in soils with a clay content lower than 20% or in soils of sandy-loam or loamy-sand textures. Carbon, which is fundamental to climate stability as well as to soil quality and productivity, continues to be lost by many current methods of raising annual vegetable crops. This is particularly distressing in the northeastern United States, where soils are thin and 70% of cropland is rated as highly erodible, twice as much as in the rest of the country. Bare soil is perhaps the most obvious sign of these soil depleting practices. Such soil is exposed to wind and water erosion, provides no barrier to direct atmospheric oxidation of soil carbon, accumulates no biomass, and contributes to the breakdown of soil aggregates. Bare soil is common on organic farms because tillage is our primary method for controlling weeds and preparing beds for planting. But tillage has many negative side effects. From the farmer’s point of view it dries the soil, brings up and encourages the germination of dormant weed seeds, creates compaction at the bottom of the tilled layer, and sets back the growth of fungi and the soil aggregation they facilitate. From the climate perspective even occasional tillage is also directly associated with significant greenhouse gas emissions and soil carbon loss from soils with high organic matter content. Many northeastern organic farmers have already adopted no till methods for better soil resiliency and reduced weed germination. They use diverse methods to avoid bare soil including extending cropping duration, cover crops, and various mulches and composts. In support of these methods, various appropriate bed formation and planting approaches have been developed including specialized dibbles and planters, broadcast systems, and transplant devices. For farmers, use of cover crops is a fundamental tool for building a healthy soil while raising crops. Cover crops can be temporary crops planted between the cash crops, crops to fix, catch or “lift” extra nutrients to the crop root zone, or permanent mulches. They increase soil aggregation, reduce nitrogen leaching, discourage wind and water erosion, decrease weed pressure, sustain microbial life, and elevate the microbial community’s fungal/bacterial ratio which aids plant vigor. From the point of view of a sustainable climate, cover crops not only pump carbon into the soil like all plants but provide green and, after death, brown soil cover to minimize oxidation from atmospheric exposure. When they contain a mixture of varieties including legumes they reduce losses not only from carbon dioxide but also nitrous oxide, a particularly potent greenhouse gas. The National Resource Conservation Service has done excellent work focusing on the benefits brought to soil by cover crops. Their booklets, lectures, videos, etc, have been important resources educating farmers about these contributions and how to manage cover crops in various cropping systems. 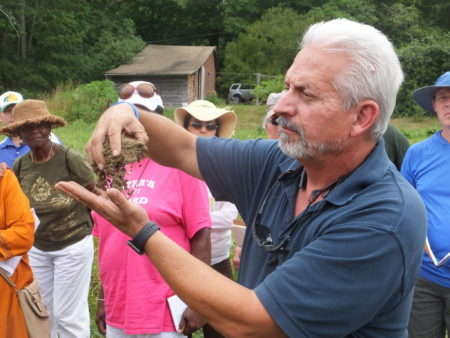 The importance of a diverse soil biology can hardly be overstated for good farming. Plants thrive when part of a symbiotic underground community or ecosystem to which they supply carbon compounds that sustain microbial metabolic functions and from which they receive minerals, water, and an array of compounds synthesized by bacteria specifically to help them resist disease, repel predation, encourage pollination, and accomplish dozens of other biological functions. Earthworms, termites, ants, insect larvae, nematodes, bacteria, fungi and others all also play a role in creating good soil structure, providing nutrient cycling, and creating the porosity, aeration and soil drainage which enable good water infiltration and storage. Crop rotation is also important for biodiversity. Studies have shown that crops in rotation show increased soil enzyme activity and, if containing legumes, increased microbial biomass. Plant biodiversity also enhances soil carbon dynamics and increases the level of soil organic matter, while attracting a corresponding diversity of insects, pollinators, and other largely beneficial organisms. For organic farmers, the absence of synthetic pesticides and fertilizers is basic. In much of US agriculture, however, chemicals are omnipresent. When perusing articles and studies about farming methods, one must be cautious. Reports of “no-till” practices often fail to mention concurrent herbicide use to control weeds. Yet toxins and synthetic fertilizers decimate the gains of biodiversity by either directly destroying microbial life or starving it by undercutting the symbiosis driving soil ecology. So students of soil science need to be clear whether or not synthetic chemicals were involved in the activities studied. When that data is available, the results for soil health can be surprising. Yet natural ecosystems such as pastures and forests that do not involve synthetic chemical inputs build, rather than reduce, soil carbon. Even ecosystems managed for human food production can sustain regular annual increases in soil carbon if following the above simple principles.